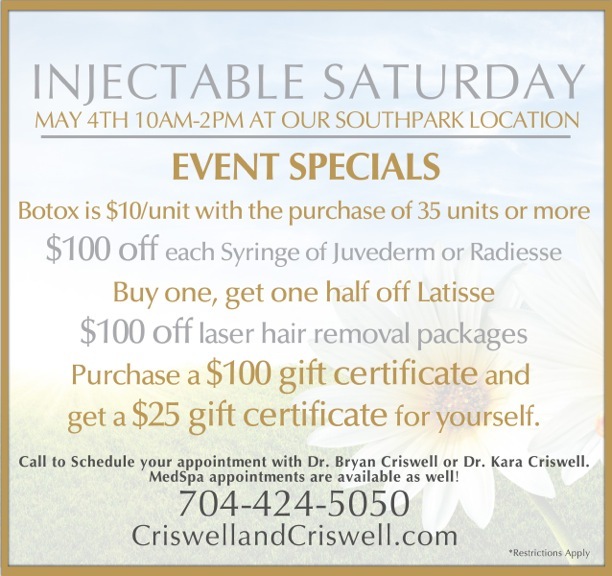 Criswell and Criswell Plastic Surgery will be hosting another Injectable Saturday Event. The past injectable events have been huge hits, so back by popular demand Dr. Bryan and Kara Criswell will be hosting another event just in time for Summer! This event will take place on Saturday, May 4th from 10am to 2pm at the Criswell and Criswell Plastic Surgery SouthPark location. There will be specials on Botox, Juvederm, Radiesse, Latisse, Laser hair removal packages. We look forward to you joining us for a wonderful day at our SouthPark location. Please call to schedule your appointment with Dr. Bryan Criswell or Dr. Kara Criswell at 704.424.5050. MedSpa appointments are available as well!